It's an all-time classic and perennial top-seller, and perhaps most impressively, the inaugural member of our blog's Hall of Fame AKA "The Pantheon." Naturally, we're talking about TJ's Mandarin Orange Chicken. It's a pretty consistent winner in our book, and though occasionally imitated, it's never quite duplicated. Naturally, with this being THE Summer of Mango, here comes the newest variant: Trader Joe's Mango Chili Chicken. You can't tell me that doesn't sound gooo-ooooo-ooood. 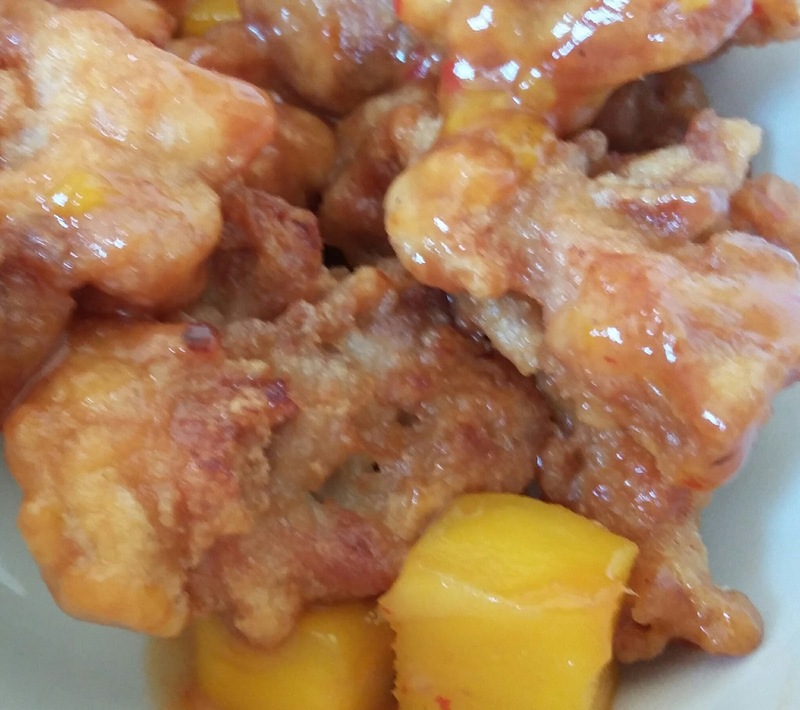 Some fruity sweet sauce glazed over some tempura-battered chicken, with a little kick of heat, with some chunks of mango tossed in for good measure, for just $4.99 - oh yeah, that's an easy sell. I guess that's why, although solid, this chicken is still kinda disappointing. Sans mango chunks, if side by side, I'm not 100% I would be able to tell the mandarin orange and mango chicken apart. They're just too similar.Yeah, there is the different flavor inflection from the mango as opposed to an orange...but it's not as divergent as it should be. And there's no discernible spice at all - if there were, my almost four year old wouldn't to'uch it, and she happily gobbled it down. And the mango chunks, well...after being frozen and reheated again, they seemed more reminiscent of canned pears than the tasty goodness I know a mango can be. So yeah, kinda a bummer after our initial excitement. The dish just seems like it ought to be a more distinctive, different dinner than it actually is. Great idea, lazy execution...but we'll probably buy it again for another easy dinner night that everyone in the family reasonably enjoyed enough. Double threes.